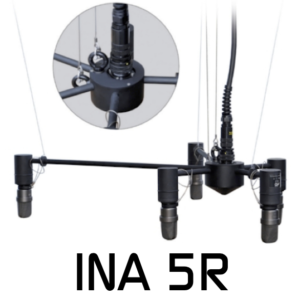 The INA 5 R is an an extended version of the INA 5. It has integrated flexible mounts and an integrated cable run. The Surround arrangement can be extended with special rain and wind protection and connector. The INA 5R configuration – Ideale Nieren Anordnung (ideal cardioid arrangement) – is an extension of the stereo INA 3 (Decca Tree) layout for surround recording. INA 3 and INA 5 are fully compatible with the 3/2 stereo format as specified in ITU 775. This microphone bracket is especially well suited for use with the large diaphragm cardioid microphone M 930. It is also suitable for the M 940 (super-cardioid) and M 950 (wide cardioid /(hypo-cardioid) with the matching MH 93 microphone holder, or EH 93 elastic suspension. When the guard rings are loosened, the microphones can be moved along the spokes. Other microphone types can also be used, e.g. the M 960 diffuse field omni-directional microphone. Thanks to the modular construction of the bracket, other recording configurations are also possible on request, e.g. OCT- System, IRT-Surround, Decca Tree.